Seven years ago, the California stem cell research program was ready to give its very first grants. Voted into law in 2004, it had been delayed by lawsuits from the religious right and anti-tax groups for almost two years. But in 2006, Governor Schwarzenegger authorized a $150 million loan to the fledgling program. Prop 71 author Bob Klein persuaded philanthropists to help as well, and it was time. The 29-member governing board (the Independent Citizens Oversight Committee or ICOC) met, debated, and took public comment. From this discussion, the Research Training Grants were born: grants to sixteen colleges or institutions, providing support for their most outstanding students. These were significant grants, one to three years long, the amount varying by the candidate's experience. Some grants ran as high as $75,000 per year, plus benefits. The Gladstone Institutes are housed on the University of California San Francisco's Mission Bay Campus. It is a large building, but everybody in it seems to know everybody else. "This is where the stem cell lab used to be," said athletic and cheerful Kathryn Ivey, Ph.D. We were standing in a closet-sized room, with plainly very limited equipment. "But right through here... "
This floor was big as a factory, but with a cheerful buzz of conversation -- and no interior walls. There were cabinets and test tubes and bio-safety "hoods" with their perpetual gush of sterile air. At the end of each multi-level row was a major piece of advanced scientific equipment, available to all who worked there. Dr. Ivey was brought up in Texas, where she earned her bachelor's degree at Texas A&M University in 1998. In 2004, she received her Ph.D from the University of Texas Southwestern Medical Center. Just one year later, her scientific mentor Dr. Deepak Srivastava was recruited to California for a job directing the Cardiovascular Disease Institute at Gladstone. He asked Kathy to come along. "I had to convince my husband that we should relocate to California," she said, shaking her head about San Francisco's higher housing costs. But when she arrived, Gladstone had just been approved for the training grants. Dr. Ivey applied for and received one of the Institution's ten grants. Kathy Ivey was exactly the kind of hard-working self-starting talented young scientist whom California should support -- and did. For three years, she immersed herself in tiny details of miniscule cells. Her goal? To attack the number one killer of women and men in the world today: heart disease. In America alone, 600,000 people die of heart disease every year -- one in every four deaths is due to heart disease -- and just one form of heart disease (coronary) costs our nation $108.9 billion a year. She would meet her enemy on the world's smallest battlefields, the Petri dish and the microscope slide. Her approach sounded simple, but was endlessly complicated: to draw the genomic blueprint of the developing heart, learn from it what happens when things go wrong, and plan how stem cells might help. For instance, a heart attack leaves a scar -- was there a way to turn that scar into new and healthy beating-heart tissue? Questions led to questions. One piece of the puzzle might be microRNAs, little-known blueprinting cells which might be used to turn on heart regeneration and restore its vital function. Could they signal the heart to heal itself? Working with other Gladstone scientists, she performed experiments leading to such papers as "MicroRNA regulation of cell lineages in mouse and human embryonic stem cells." The training grant "made it possible for her to take on more big-risk, big-reward science", said Gladstone Senior Investigator Bruce Conklin. "It was a game-changer for her to be able to work on that, and for Gladstone as well," continued Dr. Conklin. "Today, the Gladstone Institute is known for its fantastic stem cell work. Nobel Prize winner Dr. Shinya Yamanaka now works part-time with us. But before the training grants, we had very little human stem cell work. "Of all the grants Gladstone ever received, this was the most transformative. It seeded the beginnings of new ideas. You can draw a direct line from that to multiple projects... like reprogramming to make cardiac cells; potential drugs to cure Huntington's disease and ALS: drug-screening processes and others; these began only because the Research Training Grants allowed new scientists financial assurance," said Bruce Conklin in an interview. As Dr. Ivey's competence became clear, she was trusted with more responsibilities, moving up the ladder. Today she is Director of the Gladstone Stem Cell Core. In addition to her own research, she and her assistants John Chunko and Uma Lakshmanan look after the stem cell needs of some 40 scientists. 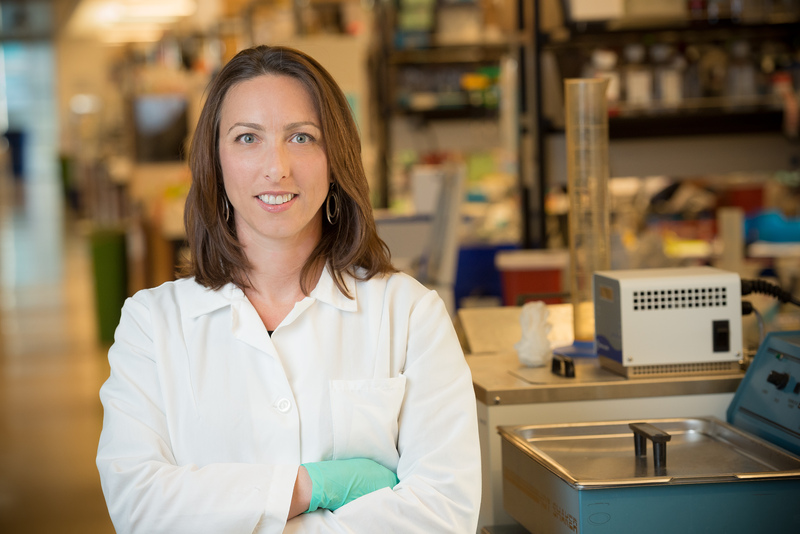 She is now an Investigator for the Roddenberry Center for Stem Cell Biology and Medicine, and an Adjunct Assistant Professor at the University of California, San Francisco. Ann Foley, Weill Cornell Medical College, New York. Here is the new generation, stem cell scientists fighting day by day to turn the hope of cure into reality. But what if there had been no California stem cell program, no Research Training Grants to change their lives? "If I had stayed in Texas, I could never have done the work I have done here," says Kathryn Ivey, Ph.D, director of the Gladstone Institute Stem Cell Core.